At its base, it is made from yogurt, garlic and cucumbers. It is served in every taverna as part of the mezze platter, and it is one of the best-loved and best-known assets of Greek cuisine, in Greece and around the world. It is served on its own, on top of stuffed vine leaves or with grilled meats, souvlaki and gyro, with the addition of certain herbs. In order to get a thick, nearly solid, yogurt, as close to Greek yogurt as possible, the method suggested here is to strain the yogurt you find in these parts overnight using a cloth, in the refrigerator, so that it loses fluids and thickens. "Gad" sheep yogurt is thick and an excellent choice, and if you use it, you can skip the straining. 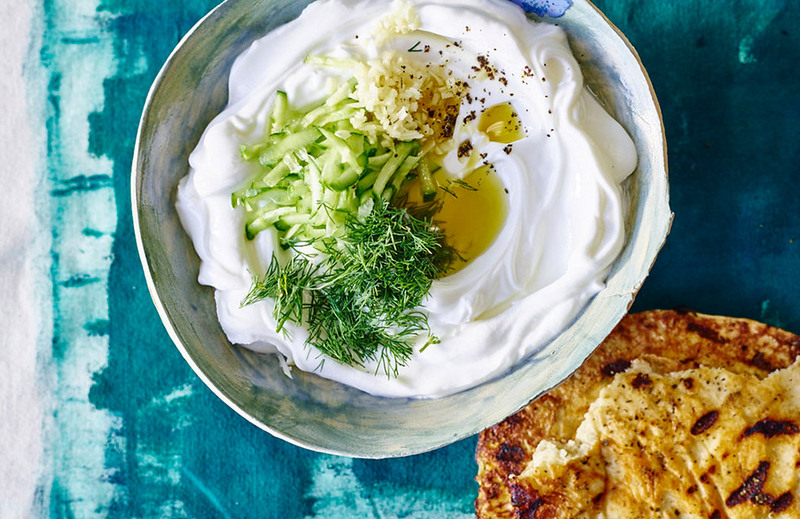 A third option is to use labneh with a little yogurt mixed in. Line a colander with cloth and pour the yogurt in. Place on top of a bowl and place in the refrigerator overnight. The amount you will get after straining will be around 2.5 cups. The next day, grate the cucumbers and squeeze the fluid out of them by hand. Move the yogurt and the cucumbers to a bowl and add the rest of the ingredients. Stir thoroughly and serve.